When I first learned about financial independence, I remember being a bit turned off by the concept. It felt a little selfish and self-serving, but I was also intrigued. Amongst a number of blogs, I began to read Our Next Life religiously. I found that Tanja’s approach to financial independence seemed substantially different than many of the blogs I’d read. Because I was able to identify so much with Tanja’s story, I began to look at financial independence in a different light. Tanja worked in a mission-driven organization for her entire career. She wanted to use her time and the newfound freedom to do important work in her community. It also became clear that, to her, financial independence wasn’t just about money; it was about life. It was about crafting an incredible life that you want to live. Tanja played a huge role in helping me believe that this FI thing might actually be for me. 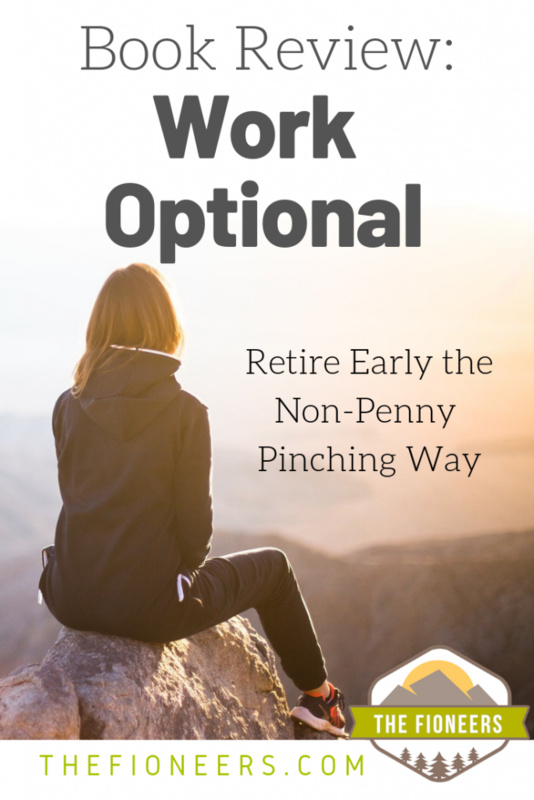 So, when Tanja published her first book, “Work Optional,” I knew I needed to read it. While some aspects of the book contain the same typical messages as FI literature generally, there were a number of insights I found unique. These unique insights helped me crystallize a number of things about my own journey toward Financial Independence. Because this book is meant to be accessible to people who do not understand Financial Independence and are not currently on the path, it makes sense that Tanja would start with the basics. A few of the basics that she discusses include thoughts on work, the role of money in our lives, and saving. Given that the majority of people are busier than ever before, it’s no surprise that many people are beginning to question the default of working 40-50 hours/week for 45-50 years. This was certainly the case for me before I left my previous job. I was working 50-hours/week, had a 45-55 minute commute, and I was miserable. Tanja also goes into the role that money can play in our lives. Similar to Tanja’s insight here, it wasn’t until I had a similar paradigm shift about money that things really clicked for me. I can use my money to buy stuff, OR I can use my money to buy back my time. Don’t EVER consider investing your money with a financial advisor that takes a percentage of your portfolio. As expected, many important points were similar to FI literature across the board, but there were a number of unique messages that I felt broke new ground. These new insights made me think about my journey in a whole new way. As you might know, I’ve done quite a bit of work to define my “work optional” life already. I’ve spent time (re)discovering my passions and realizing that I want to live a location independent lifestyle but still have a home base. In Chapter 2, there are a series of questions to help you think through your ideal life. While many of these questions were quite similar to ones I’ve considered before, there were two questions that made me think about my life in a deeper way. While I’ve planned out a lot of the big things that I want to do in my life (travel to 100 countries, learn various languages, etc. ), I hadn’t really thought about what my ideal everyday life would look like in between the big milestones. I want to have a slow morning routine that includes breakfast, meditating, and journaling before getting into my day. Creativity, balance, and connections with others will be central. I want to have the opportunity to share knowledge and help people learn new things. These things are important pillars for me to think about as I work toward my ideal life. I really struggled with this question. It’s not because I couldn’t think of a problem that I wanted to solve. I’ve always wanted to make the world a better place. For my 7-year-old birthday party, I had all of my friends do a food scavenger hunt, so we could donate food to the local food bank. I started volunteering at a homeless shelter with my family when I was 5. I have lived in the midst of families living on less than $1/day. I have seen the pervasive impacts of poverty and racial inequality in our society. I feel a responsibility to do something about it. However, I’m trying to build a more balanced view of my capabilities and my responsibility to contribute to the world. I’ve spent my whole life volunteering or working toward different causes, and I’ve worked myself to the bone. For me this caused debilitating anxiety. At this point in my life, I’m trying to find a better balance in life – focused on both doing work that will make the world a better place AND improve my own health and happiness. One thing that encouraged me in this chapter is that Tanja recommends looking at your brainstormed list and crossing out things that are unrealistic. Given the current state of my mental health, I will likely not be able to do “world-changing” work. I will probably never start a nonprofit or lead a social or political movement. I’m coming to terms with the fact that it’s okay to not want that. The truth is, I can barely hold it together working 3 days/week at my part-time job. While that could change in the future, it’s also okay (and better) to plan my life with my limitations in mind. I can’t give of myself if I’m not full and healthy. Overall, the questions in this book helped me both to think about my ideal life in a new way and to come to grips with some of my own limitations. One thing that I loved about this book was that it didn’t describe Financial Independence as a singular approach that should apply to everyone. Not everyone will have the resources to be able to fully retire early, so this approach makes Work Optional much more accessible. Full Early Retirement – This is when you have enough passive income to cover your lifestyle, and you never need to work for money again. Career Intermission(s) – This is when you can choose to take extended periods away from work by saving enough that you can still be on track for retirement after you return from the break. These options gave me a lot to think about. 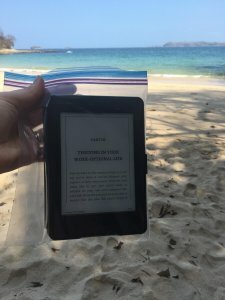 Reading this book on a peaceful beach in Panama made me long for location independence and the ability to travel more extensively before we reach full financial independence. Our current plan is to reach full FI within the next 8-10 years. However, our ultimate goal for Financial Independence has never been to fully retire early. These options got us thinking about what semi-retirement could look like. When we articulate our ideal life, we would like to be location independent, have balance, have the opportunity to be creative, and to do work that we truly want to do. For us, this enjoyable active income would need to enable location independence, which is why we are focusing on our blog and considering starting online businesses that we could run from anywhere. This would mean that instead of full financial independence in 8-10 years, we could have a “two-phase” plan, where the first phase would be a semi-retirement and then we’d be able to fully retire when we are older. Because of this option, I’m considering not increasing my work hours to 4 days/week, as originally planned. I really enjoy part-time work, and it provides me with time to work on this blog and other things on the side. This approach would align more with our long-term goal of location independence. Although Tanja is one of my favorite writers in the financial independence space, it’s no surprise that we don’t agree on everything. I have a couple of critiques or enhancements that I think could be made to the approach to make it even more accessible and more countercultural. Work Optional is about more than financial independence. It’s about living our best lives possible, not being tied down to jobs that aren’t serving us, and having the freedom to make our own choices about the role that work will play in our lives. That stage is F-You Money. F-You money is having enough cash on hand to walk away from a toxic work situation, even without having another job lined up. While I am not yet to the stage where I’m taking a planned career intermission or am semi-retired (although I am working fewer hours), in many ways, I already feel like I have a “work optional” life. If things went south at my job, I could leave at any time. In fact, this happened last year. My previous job was causing extreme anxiety, and I ended up deciding to leave without having another job lined up. Yes, I would need to find another job eventually, but I would have the time and space to ensure that I found something better. With F-You money, I am confident that, in the short-term, my work is completely optional. The biggest critique that I have of the FIRE community generally is that I’m not sure people think creatively enough about what they can change right now to improve their lives. It seems like many people still see Financial Independence as a two-phased journey – where you work hard now during the accumulation phase and you have fun and enjoyment later. I’m so happy to see that Tanja is recommending slowing down and aligning your current life even more to your ideal life along the journey. I would have loved to see this idea play a larger role in the book with more examples of how people have aligned their current lifestyles with their ideal visions along their journey. Aligning with your ideal life now can dramatically increase your happiness and quality of life along the journey. To us, that is what Financial Independence is all about. This book provided a lot of helpful insights, made me think more deeply about my ideal life and the various options for how to get there. While there were a number of unique insights, I’m confident that this book would also be accessible to someone not familiar with personal finance or financial independence. Overall, I give this book high marks and would encourage anyone to pick it up.